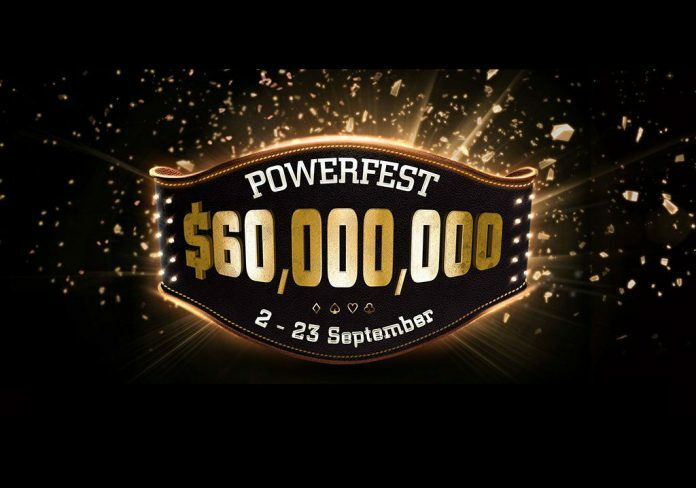 Two partypoker POWERFEST Sundays are now in the books, and yesterday’s Day 8 saw another very busy day logged at the felt. A total of 13 High, High Roller, and Super High Roller events took place throughout the busy Sunday grind, and it came as no surprise that the biggest winner of the day also came from the tournament with the largest buy-in. ‘BackDoorMat’ took down Event #49 High Roller Championship Event: $5,200 No Limit Hold’em Progressive Knock-out, outlasting 203 entries to bank $103,479.25 plus an additional $124,600 in bounties. Having won an event a couple of days ago, partypoker ambassador Patrick ‘pleno1’ Leonard made another final table, ultimately finishing in fifth place in the aforementioned SHR. The second biggest prize awarded went to ‘Paul_Folders’ who won Event #51 High Roller Championship Event: $1,050 No Limit Hold’em Progressive Knock-out for $86,086 and a bounty prize of $62,740. The player known an ‘EggsBenedict’ will have certainly been treated to a nice breakfast today, as last night they won Event #48 High Roller: $1,050 No Limit Hold’em Progressive Knock-out, defeating 541 runners for $50,421.20 plus $53,510 in bounties. Other big winners on the day include ’iikori’, ‘shakentucan’, ‘IgorFederal’, ‘LeadRush’, ‘nnizregnaD’, ‘TINY44’, ‘FAAJTss’, ‘ginger_master’, ‘aguachapelada’, and ‘Ash15912’.